Ninety percent of the time when the words “Grateful Dead lyricist” appear, they’re attributed to Robert Hunter who penned the vast majority of the band’s lyrics. All too often, the Dead’s “other” lyricist is left out of the picture. John Perry Barlow, who passed away on Feb. 6 at the age of 70, also wrote dozens of songs for the band. And while Hunter wrote mostly for Jerry Garcia, Barlow wrote for Weir with whom he’d been a friend since high school. Over the years, the pair crafted a hefty batch of tunes that became staples of the Dead’s repertoire. In honor of Barlow’s passing, here are five of the best. With poetic imagery redolent of the last gasp of the Great Hippie Dream, “Cassidy” was among a number of songs Barlow wrote with Weir for the latter’s 1972 solo debut Ace. It’s inspired both by the birth of Cassidy Law (to Grateful Dead extended family members Eileen Law and Rex Jackson) as well as Beat legend Neal Cassady (the muse for Kerouac’s On the Road). The “child of boundless seas” is surely the newborn; the soul “lost now on the country miles in his Cadillac,” likely the proto-beatnik. But the closing refrain, “Fare thee well now, let your life proceed by its own design/Nothing to tell now, let the words be yours, I’m done with mine” may be for both of them. This tune from Terrapin Station (1977) represents a dark side of the aforementioned West coast hippie dream. It’s written from the first-person perspective of a dreamer whose visions turn delusional, a religious zealot spouting proclamations of a fire-and-brimstone future while espousing his own exalted spiritual status. He’s the kind of character who could quite conceivably become a Charles Manson with one push too far in the wrong direction. But Weir’s slinky, 7/4 setting helped make the whole experience seductive. Like Hunter, Barlow was adept at spinning out strings of sophisticated poetic imagery. But when the situation demanded, he knew how to keep it simple too. On this sorrowful, country-tinged tune (also from Ace), Barlow aims straight for the heart. What he and Weir came up with packed enough emotional punch to become a ubiquitous part of the Dead’s setlists for the remainder of the band’s existence. When the Dead experienced their late-’80s renaissance with In the Dark, Barlow was right there with them. And in the age of Reagan, he provided that album’s only political moment. “Throwing Stones” is a wide-ranging song, lyrically dense but never lacking in momentum as it analyzes the American sociopolitical scene of the day. Taking both the establishment and the anti-authoritarians to task, Barlow gets off some of his best lines (“by and by the morning sun will rise / but the darkness never goes from some men’s eyes”) while lamenting the state of the world being left for the next generation. The denouement: “the kids they dance and shake their bones, and it’s all too clear we’re on our own, singing ashes, ashes, all fall down.” Crucially, Weir’s pulsing framework provides us all with the same kind of rock n’ roll redemption that is “the kids”‘ only salvation. 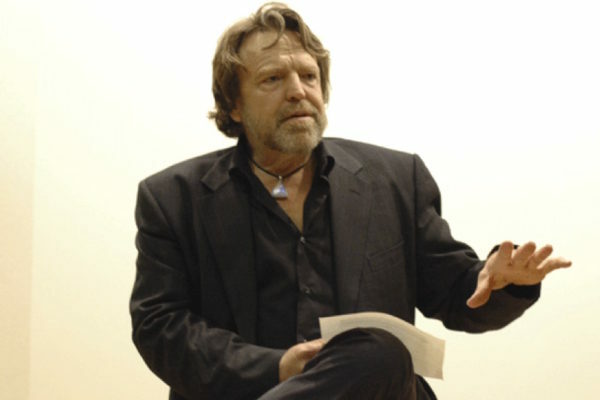 Photo Credit: Image of John Perry Barlow (cropped) provided by the European Graduate School courtesy of Wikipedia.